To mark World Book Day on Thursday 7th March, we’re hosting a lunchtime pop-up library outside the University reception. Come by the stall between 12pm and 2pm to borrow books, hear library staff book suggestions or make your own. We’ll have a range of books from fiction to medical bestsellers, with a particular focus on female writers in fiction and science to celebrate Academic Book Week (4-9 March) and International Women’s Day (8 March). Make sure you bring along your ID card to borrow a book. This week (19th-23rd May) is national Learning at Work Week, and to celebrate St. George’s Library has republished its guide to resources for non-clinical staff. The guide outlines books and resources available from the library to support the learning and development needs of administrative and managerial staff working at St. George’s, and highlights our collection of non-clinical information sources. Topics covered by the guide include time management, leadership, cv writing and interview skills and marketing tips. Visit our pop-up library stand to find out more about this, and other library services that can quench your thirst for learning something new. Our drop in lunch time surgeries are designed to save you time by bringing our Library Services to you. 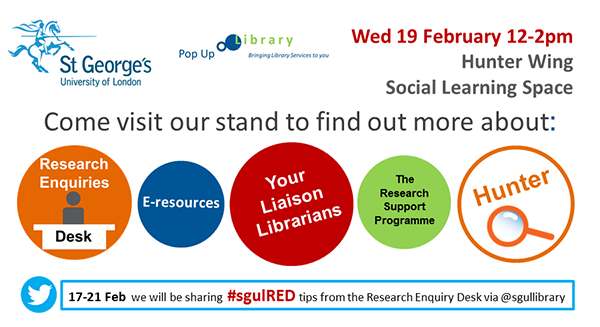 Please come along to one of our events to join the Library, or to ask us any questions you may have about finding or accessing evidence based information.